A group of teenage Venturer Scouts must make a life and death decision when some Girl Guides are threatened by warring motorcycle bikie gang members. Scott Morrow and his Venturer Unit organise a scuba dive and a special ceremony to welcome a new Scout into the Unit at a picturesque seaside setting. Calm is shattered when a vicious war between two motor cycle gangs erupts at the dive site. Scott and his fellow Venturers are forced to answer questions of courage when the lives of a group of Girl Guides are threatened: Will they stand and be counted when their own lives could be at dire risk? Will they stand at all? A Rite Of Passage is a novel showcasing the determination of teenagers who become young men when fate steps in. 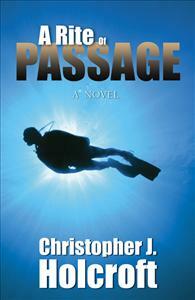 A Rite of Passage- A Novel by Christopher J. Holcroft A Rite of Passage details the latest exploits of Venturer Scott Morrow and his unit, his latest endeavour; learning to dive. Scott is already famous for his escapades with the Russian Mafia after they captured his unit, and furthermore from his daring and brave rescue of a fellow Venturer and then a Rover during a canyoning accident. A Rite of Passage is aimed at teenage boys to encourage them to read and experience more of life by getting outdoors and living the adventure. It should surely achieve this, because it is easy and pleasant to read and provides a simple to understand, yet highly insightful look into perspectives we wouldn’t usually see which could only be formulated by someone with great experience and knowledge. We are allowed to see into the lives of gang members, which we are not usually exposed to through the media – we get to contrast our existing perceptions, challenging us to think more broadly about what we really know about people who are so often stereotypically portrayed. We gain a better understanding of what goes on behind the badges in the investigations of police A Rite of Passage promotes Venturing and Guiding movements in an accurate and positive light (although potential members shouldn’t expect to help fight the Mafia or dispel bike gang wars) by highlighting the different opportunities available through the movements. Not only outdoors activities like scuba diving, but social activities like the formal McDonald’s which appeal to the target audience as growing, socialising people are featured, exploring the dynamic of the movement and the variety of experiences to be had. The novel also touches on the various formalities within the movements, adding to the accuracy of their representation. A Rite of Passage touches on issues common to the targeted responder: balance of study and leisure (which Scott is forced to deal with), friendly and romantic relationships (such as those between Scott and his unit, and then that which develops between some of the Unit and the Guides) and growing up (taking on adult actions and responsibilities like leadership and bravery, and acting out of consciousness for others) and through the central character, Scott, we are shown that life can be hard, but manageable and there is no limit to what we can do if we set our minds to it. Existing members of the Venturing and Guiding movement will enjoy examining this perspective on a part of their lives, Scouts and Guides can look to it as a taste of what they can (within reason) experience in the older sections and outsiders of the movement can see it as a written reason to look up their local group. Most outstandingly however is the notion that ordinary individuals can, when placed in a situation that demands it, do extraordinary things. We, as responders, may not ever experience the crossfire of warring gangs, but we can, as average, everyday people, embark on our own extraordinary adventures by getting out into the world, challenging ourselves and trying something new – we place ourselves in the situation to achieve. It is within all our capabilities to try something new and it is through Scott Morrow that we can realise that. A Rite of Passage is the final novel in Christopher Holcroft's trilogy about the adventures of Scott Morrow and his Venturer Unit. It is set in the harsh realities of the modern world with the story of Scott Morrow interwoven with that of a biker gang turf war which conclude with a gripping and heroic ending. The novel follows on from Scott Morrow’s other adventures and focuses on him learning to dive and the ensuing dives. Scott is in the last months of his time as a Venturer and the task of courage exhibited by Scott in the climax of the novel can only be described as his rite of passage to rovers. A Rite of Passage also incorporates the parallel movement of the Girl Guides, specifically the Ranger Guides as they socialise and interact with the Venturer Scouts. The two groups of teenagers are realistically represented participating in activities such as scuba diving and a formal dinner at McDonald’s. These interactions show the blurred lines between the two movements in the 21st century which is highlighted by the Rangers requests for more adventurous activities. A Rite of Passage has an excellent story relevant to modern society and the challenges which await us, both morally and physically. It, as with the other two books in the trilogy are must reads for anyone interested Venturer Scouting. It has a suspenseful plot which will engross the reader till the very end.